Daily Illuminator: Meanwhile, Elsewhere On e23 . . .
December 30, 2011: Meanwhile, Elsewhere On e23 . . . I spend my days helping to make sure the wheels run smoothly on e23. Although we have an amazing selection of Steve Jackson Games releases on our dazzling digital domain, we also offer lots of interesting PDFs from other publishers. The end of the year is a good time to look over their high-rated releases (which usually translates to "what should I -- Steven Marsh -- check out because it looks so cool?"). Amarillo Design Bureau makes detailed tactical games, but with those details come lots of rules and options to keep track of. So it's no surprise that fans are delighted to have compiled versions of the rulebooks available as searchable PDFs. 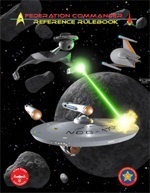 The Federation Commander Reference Rulebook is a huge hit, as is Star Fleet Battles: Electronic Master Rulebook (which actually came out in December of last year, and sold enough this year to keep it a top-seller). 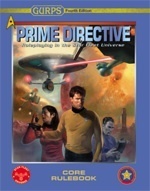 Fans of GURPS also bought lots of copies of their licensed Fourth Edition supplements, including GURPS Prime Directive, GURPS Federation, and GURPS Klingons. There's a lot of futuristic fun in these supplements, and I won't be surprised if I spend part of my holiday looking for adventure among the stars. Atlas Games has also released a gaggle of goodies that got my gaming juices flowing. As an RPG omnivore, my tastes drifted toward a slew of classic and award-winning RPG core rulebooks that were uploaded to e23 this year, including Feng Shui: Action Movie Roleplaying (pistol-packing kung-fu hijinks), Unknown Armies 2nd Edition (modern occult intrigue), and Over the Edge Second Edition (which has the subtitle The Roleplaying Game of Surreal Danger . . . and I can't top that). Of particular note is the Ars Magica 5th Edition Core Rulebook; it was just uploaded a few weeks ago, but it's already conjured a lot of buzz (unsurprising, given how popular the rest of the Ars Magica line is). At e23 we also feature non-system material, of use to any gamer, which is why Hamlet's Hit Points -- and the gamerly analytical insight it brings to three classic tales -- has found such an appreciative audience. A bunch of Traveller fans also picked up the 40-Ton Slow Pinnace by the inimitable Loren K. Wiseman (editor of our own Journal of the Travellers' Aid Society). Finally, the old-school geek in me was delighted that we uploaded Grimtooth's Traps, a classic systemless supplement that's been maiming heroes for decades. The electronic publishing revolution has made it easier and more affordable than ever for gamers to expand their horizons, and e23 has been proud to help make that happen. The future is now . . . and it's a lot of fun!